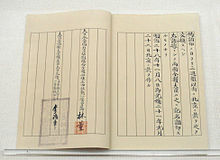 The Treaty of Shimonoseki (Japanese: 下関条約, Hepburn: Shimonoseki Jōyaku) was a treaty signed at the Shunpanrō hotel, Shimonoseki, Japan on 17 April 1895, between the Empire of Japan and the Qing dynasty, ending the First Sino-Japanese War. The peace conference took place from March 20 to 17 April 1895. This treaty followed and superseded the Sino-Japanese Friendship and Trade Treaty of 1871. Article 1: China recognizes definitively the full and complete independence and autonomy of Korea, and, in consequence, the payment of tribute and the performance of ceremonies and formalities by Korea to China, that are in derogation of such independence and autonomy, shall wholly cease for the future. Articles 2 & 3: China cedes to Japan in perpetuity and full sovereignty of the Pescadores group, Formosa (Taiwan) and the eastern portion of the bay of Liaodong Peninsula together with all fortifications, arsenals and public property. Article 4: China agrees to pay to Japan as a war indemnity the sum of 200,000,000 Kuping taels ( 7,500,000 kilograms/16,534,500 pounds of silver ). The treaty ended the First Sino-Japanese War of 1894–1895 as a clear victory for Japan. In this treaty, China recognized the independence of Korea and renounced any claims to that country. It also ceded the Liaodong Peninsula (then known to the Western press as Liaotung, now southern part of modern Liaoning province), and the islands of Formosa (Taiwan) and Penghu (also known as the Pescadores) to Japan. China also paid Japan a war indemnity of 200 million Kuping taels, payable over seven years, and the signing of a commercial treaty similar to ones previously signed by China with various western powers in the aftermath of the First and Second Opium Wars. This commercial treaty confirmed the opening of various ports and rivers to Japanese trade. As a result of the Treaty of Shimonoseki (1895), China recognized the "full and complete independence and autonomy" of Joseon. In the next year Yeongeunmun was demolished leaving its two stone pillars. During the summit between Japanese and Qing representatives in March and April 1895, Prime Minister Hirobumi Ito and Foreign Minister Munemitsu Mutsu were serious about reducing the power of Qing Dynasty on not only the Korean Peninsula but also the Taiwan islands. Moreover, Mutsu had already noticed its importance in order to expand Japanese military power towards South China and Southeast Asia. It was also the age of imperialism, so Japan wished to mimic what the Western nations were doing. Imperial Japan was seeking colonies and resources in the Korean Peninsula and Mainland China to compete with the presence of Western powers at that time. This was the way the Japanese leadership chose to illustrate how fast Imperial Japan had advanced compared to the West since the 1867 Meiji Restoration, and the extent it wanted to amend the unequal treaties that were held in the Far East by the Western powers. 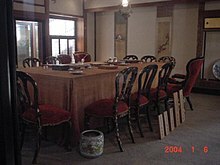 At the peace conference between Imperial Japan and Qing Dynasty, Li Hongzhang and Li Jingfang, the ambassadors at the negotiation desk of Qing Dynasty, originally did not plan to cede Taiwan because they also realised Taiwan's great location for trading with the West. Therefore, even though the Qing had lost wars against Britain and France in the 19th century, the Qing Emperor was serious about keeping Taiwan under its rule, which began in 1683. On 20 March 1895, at Shunpanrō (春帆楼) in Shimonoseki in Japan, a one month long peace conference began. At the first half of the conference, Ito and Li talked mainly about a cease-fire agreement, and during the second half of the conference, the contents of the peace treaty were discussed. Ito and Mutsu claimed that yielding the full sovereignty of Taiwan was an absolute condition and requested Li to hand over full sovereignty of Penghu Islands and the eastern portion of the bay of Liaodong Peninsula. Li Hongzhang refused on the grounds that Taiwan had never been a battlefield during the first Sino-Japanese War between 1894 and 1895. By the final stage of the conference, while Li Hongzhang agreed to the transfer of full sovereignty of the Penghu islands and the eastern portion of the bay of Liaodong Peninsula to Imperial Japan, he still refused to hand over Taiwan. As Taiwan had been a province since 1885, Li stated, "Taiwan is already a province, and therefore not to be given away (臺灣已立一行省，不能送給他國)." However, Imperial Japan was too strong for the Qing Dynasty to cope with, and eventually Li gave Taiwan up. On 17 April 1895, the peace treaty between Imperial Japan and the Qing Dynasty had been signed and was followed by the successful Japanese invasion of Taiwan. This had a huge impact on Taiwan, the turning over of the island to Imperial Japan marking the end of 200 years of Qing rule despite an attempt by Qing loyalists to prevent the annexation. The treaty was drafted with John W. Foster, former American Secretary of State, advising the Qing Empire. It was signed by Count Itō Hirobumi and Viscount Mutsu Munemitsu for the Emperor of Japan and Li Hongzhang and Li Jingfang on behalf of the Emperor of China. Before the treaty was signed, Li Hongzhang was attacked by a right-wing Japanese extremist on March 24: he was fired at and wounded on his way back to his lodgings at Injoji temple. The public outcry aroused by the assassination attempt caused the Japanese to temper their demands and agree to a temporary armistice. The conference was temporarily adjourned and resumed on April 10. The conditions imposed by Japan on China led to the Triple Intervention of Russia, France, and Germany, western powers all active in China, with established enclaves and ports, just six days after its signing. They demanded that Japan withdraw its claim on the Liaodong peninsula, concerned that Lüshun, then called Port Arthur by Westerners, would fall under Japanese control. Tsar Nicholas II of Russia (a de jure ally of France) and his imperial advisors, including his cousin-advisor-friend-rival Kaiser Wilhelm II of Germany, had designs on Port Arthur, which could serve as Russia's long sought-after 'ice-free' port. Under threat of war from three Western political powers, in November 1895, Japan — a weaker emerging nation not yet perceived as even a regional power — returned control of the territory and withdrew its de jure claim on the Liaotung peninsula in return for an increased war indemnity from China of 30 million Taels. At that time, the European powers were not concerned with any of the other conditions, or the free hand Japan had been granted in Korea under the other terms of the Treaty of Shimonoseki. This would prove to be a mistake, as Japan would end up occupying Korea by 1905 and expand into Russia's sphere of influence with the Russo-Japanese war, and then encroach upon Germany's port in Shandong during World War I. Within months after Japan re-ceded the Liaodong peninsula, Russia started construction on the peninsula and a railway to Harbin from Port Arthur, despite a protesting China. Eventually, Russia agreed to offer a diplomatic solution (See Kwantung Leased Territory) to the Chinese Empire, and agreed to a token lease of the region to save face, instead of annexing Manchuria outright, its de facto effect. Within two years, Germany, France, and Great Britain had similarly taken advantage of the economic and political opportunities in the weak Chinese Empire, each taking control of significant local regions. Japan also took note of how the international community allowed the great powers to treat weaker nation states, and continued its remarkable measures to bootstrap itself into a modern industrial state and military power, with great success as it would demonstrate in the Russo-Japanese War less than a decade later. In Taiwan, pro-Qing officials and elements of the local gentry declared a Republic of Formosa in 1895, but failed to win international recognition. In China, the Treaty was considered a national humiliation by the bureaucracy and greatly weakened support for the Qing dynasty. The previous decades of the Self-Strengthening Movement were considered to be a failure, and support grew for more radical changes in China's political and social systems which led to Hundred Days' Reform in 1898. When the latter movement failed due to resistance from the Manchu nobility, a series of uprisings culminated in the fall of the Qing dynasty itself in 1911. The Triple Intervention is regarded by many Japanese historians as being a crucial historic turning point in Japanese foreign affairs – from this point on, the nationalist, expansionist, and militant elements began to join ranks and steer Japan from a foreign policy based mainly on economic hegemony toward outright imperialism — a case of the coerced turning increasingly to coercion. Both the Republic of China, now controlling Taiwan, and the People's Republic of China, now controlling mainland China consider that the provisions of the treaty transferring Taiwan to Japan to have been reversed by the Instrument of Surrender of Japan. Additionally, it is alleged that on 28 April 1952 the contents of the Treaty of Shimonoseki treaty were formally nullified through what is commonly known as the Treaty of Taipei with the Republic of China. However, Ng (1972) argues that only those provisions of the 1895 treaty which had not yet been fulfilled in their entirety could be subject to nullification. The cession provision which had already been carried out was no longer existent and, therefore, could no longer be subjected to nullification. In support of this reasoning, Ng points to the reparations provision of Article IV of the 1895 treaty, as well as additional reparations provisions from earlier Sino-Japanese agreements & treaties. These were all regarded as "fulfilled provisions" and not subject to later nullification or cancellation. The People's Republic of China does not recognize the Treaty of Taipei. Russia wasted little time after the Triple Intervention to move men and materials down into the Liaodong to start building a railroad from both ends — Port Arthur and Harbin, as it already had railway construction in progress across northern Inner Manchuria to shorten the rail route to Russia's principal Pacific Ocean naval base at Vladivostok, a port closed by ice four months of each year. Russia also improved the port facilities at Port Arthur and founded a commercial town nearby at Dalniy (modern-day Dalian, which now encompasses Port Arthur in its jurisdiction), before inking the lease of the territory. When the de facto governance of Port Arthur and the Liaodong peninsula was granted de jure to Russia by China along with an increase in other rights she had obtained in Manchuria (especially those in Jilin and Heilongjiang provinces) the construction of the 550 mile Southern spurline of the Manchurian Railway was redoubled. Russia finally seemed to have gotten what the Russian Empire had been wanting in its quest to become a global power since the reign of Peter the Great. This ice-free natural harbor of Port Arthur/Lüshun would serve to make Russia a great sea as well as the largest land power. Russia needed this ice-free port to achieve world power status as it was tired of being blocked by the balance of power politics in Europe (The Ottoman Empire and its allies had repeatedly frustrated Russian power fruition). However, the omission of the geopolitical reality in ignoring the free hand Japan had been granted by the Treaty (of Shimonoseki) with respect to Korea and Taiwan was short-sighted of Russia with respect to its strategic goals; to get to and maintain a strong point in Port Arthur Russia would have to dominate and control many additional hundreds of miles of Eastern Manchuria (the Fengtian province of Imperial China, modern Jilin and Heilongjiang) up to Harbin. Japan had long considered the lands paralleling the whole Korean border as part of its strategic Sphere of Influence. By leasing Liaodong and railway concessions, Russia crashed its Sphere of Influence squarely into Japan's. This acted as a further goad to emerging Japanese anger at their disrespectful treatment by all the West. In the immediate fallout of the Triple Intervention, Japanese popular resentment at Russia's deviousness and the perceived weakness of its own government caving in to foreign pressure led to riots in Tokyo. The disturbance almost brought down the government, as well as a strengthening of imperial and expansionist factions within Japan. The Russian spear into the sphere also brought about the ensuing struggle with Russia for dominance in Korea and Manchuria. These events eventually led to the Russo-Japanese War of 1904–1905 by a renewed and modernized Japanese military, which led to a major defeat for Russia that marked the beginning of the end for the Romanov dynasty. ^ Assuming $18/oz, in 2015. ^ Ng, Yuzin Chiautong (1972). Historical and Legal Aspects of the International Status of Taiwan (Formosa) (2nd ed.). Tokyo: World United Formosans for Independence. LCCN 74165355. Retrieved 2010-02-25. Sedwick, F. R. (1909). The Russo-Japanese War, 1909. New York: Macmillan Company. Warner, Dennis and Peggy Warner. (1974). The Tide At Sunrise. New York: Charterhouse. 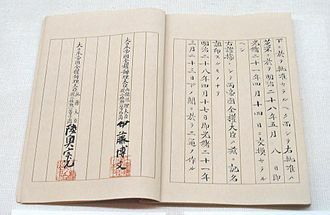 Wikimedia Commons has media related to Treaty of Shimonoseki, 1895.